Charles “Charlie” J. Molyet, Sr.
Charles “Charlie” J. Molyet, Sr., 92, of Fremont, OH passed away at home on Tuesday, January 23, 2018. He was born on June 28, 1925 in Fremont to Ralph G. and Agnes C. (McDermott) Molyet. Charlie served in the U.S. Army during WWII in Northern France and the Rhineland. He was captured and spent eight months as a Prisoner of War at Stalag 12 A, Germany. Charlie was awarded the American Theater Ribbon; EAME Theater Ribbon w/2 Bronze Stars; Good Conduct Medal and WWII Victory Medal. Charlie married Vera Mae Dodson on November 28, 1946 at St. Ann Catholic Church in Fremont and she preceded him in death on August 15, 2011. Charlie delivered milk for Pet Milk for ten years. He then worked at Herbrand Corporation for twelve years. Charlie had a Delivery Service for eighteen years and then worked a Hughes Construction for five years. He worked at Sandusky Metropolitan Housing Authority as a Maintenance Supervisor for eleven years and retired in 1990. 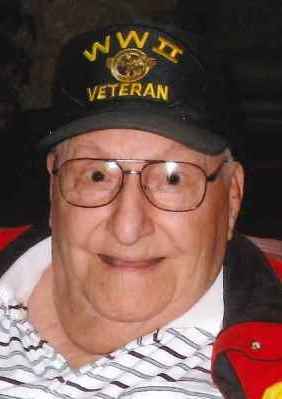 Charlie was a Life member and Past Commander of VFW Post 2947; a member and Past Commander of American Legion #121where he served with the Color Guard and Military Honor Guard; Disabled American Veterans Post #33; Eagles #712, all in Fremont and a member of the Maumee Valley P.O.W.’s. Charlie loved to play euchre, bingo at the American Legion and going to Whitey’s. Charlie is survived by his daughters, Sally (Jim) Grubb and Susan Byers both of Fremont, OH; nine grandchildren; eleven great grandchildren and two great great grandchildren. He was preceded in death by his wife, Mae Molyet; parents; son, Charles Molyet, Jr.; son-in-law, Don Byers; siblings, Bernard Molyet, Marguerite Morley, Bernadine Ritchey and Ann Hamilton. A Memorial Service will follow the Visitation at 5:00 pm with Military Honors provided by the American Legion and VFW. Pastor Dan Vickey will officiate. Offer Condolences for the family of Charles “Charlie” J. Molyet, Sr.
Sally: So sorry to hear of the passing of your father. He lived a long good life, and served his country well. My thoughts and prayers go out to the whole family! May there be peace knowing he is with his family in heaven. God bless everyone and so sorry for your loss. He was a wonderful person. So sorry to hear. Wish I could be there. Prayers for peace and comfort. Wishing peace for your family as you go through these tough times. Charles was a wonderful caring man. I always remember him playing his favorite song on the jukebox “Hello Walls”. Will think of him often. So sorry to hear about your dads passing. Be strong as I know you can, Sally. My thoughts are w/you. You have my deepest sympathy on the loss of your Dad. He was the last of the Molyet boys ! And what a crew they were ! Remember all the great stories of my Dad and my Uncle Don and your Dad growing up ! So sorry for your loss. Charlie was a good man, he was so special to dad. I know how much you will miss him. I was a neighbor to Delphine Moylet Foos at Bellevue, OH. Am sure she was maybe an aunt to your Dad. They loved to play euchre & would “shoot the moon ” & “go up the river”…. Now we play euchre (very simple at first) but have learned to do all those extras & it gets pretty wild & funny at time. Good Memories of yesteryear. Sorry for your loss; may you have many treasured memories of good times in the yester-years… Jackie Boyer Wynbissinger; Ashford Ave. neighbor to the Foos Family on Arion St. Delphine use to call my sister Judy….Boyerbrat. And would tell her, if you’re not going to work; go home because Raydelle has work to do. It worked; Judy worked more at Foos’s than she did at home….and there was always candy to enjoy! Sue, I’m so sorry for your loss. Your Dad was a great man and a good role model for the young ones in your family. May God guide you in this difficult time.